Carrion Crows have a complex social structure. Territory-owning Carrion Crows remain paired year round, often flying and feeding together or not far from one another. They remain near their nest during the breeding season, although they may range wider outside this period. Birds that don't hold a territory form part of a loose flock that roosts communally, usually in large trees. Both male and female of a pair participate in territory defence, keeping other crows (or potential predators) away from the nest. Males have a more prominent role: if a male loses his mate he is able to defend the territory until he remates, but a female losing his mate will also lose her territory, as she would rapidly be evicted by other pair. In one of my local parks there is a very high density of Crows. There are several territories, but the park is also the main ranging area of the non-breeding flock (where there is also a winter roost). There are a lot of interactions going on, but without ringed birds, it is hard to make sense of what is actually happening. Yesterday, I observed several interesting interactions. First, a Black-headed gull appeared most annoyed with a Carrion Crow and mobbed it repeatedly, dive-bombing on it when the crow tried to stop on an aerial. The crow did not vocalise and deftly avoided the gull attacks. Later, I heard the rattling call of a crow and watched a chase between two crows, one of them calling with the call I usually associate to mobbing a raptor. 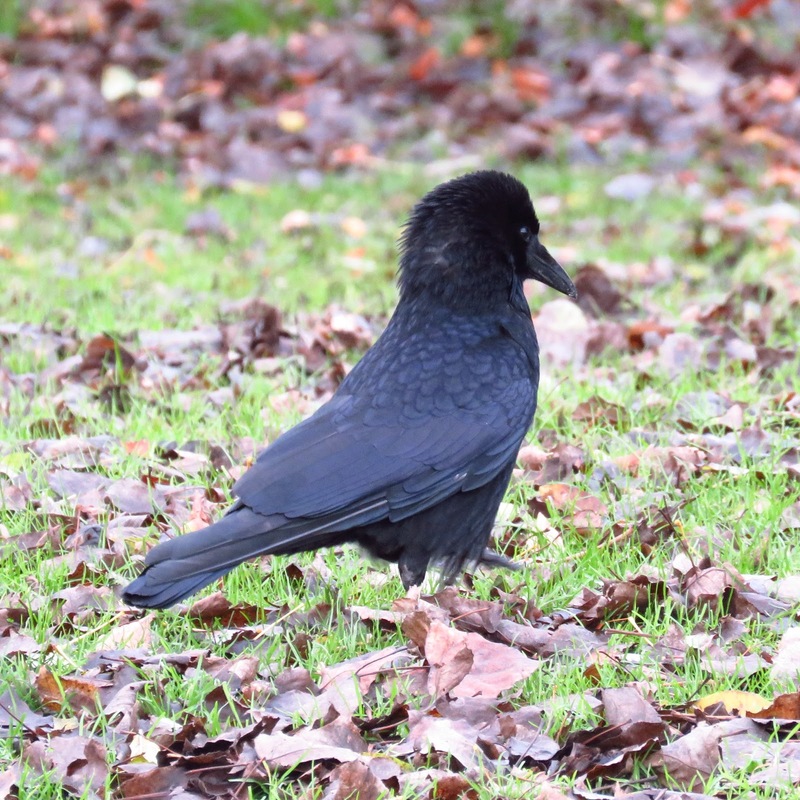 Crows, it appears, can use this vocalisation to fend off conspecifics. Finally, I watched a Crow it an amazing display: its head feathers raised, bill pointing down, looking really at its best. After taking a few photos, I realised it's partner was walking nearby using the same posture. Today I learned about this display in 'The Crows' by Franklin Coombs. It is called the 'Bristle head' display. It is a territory-owner display, used in territory boundaries to signal their occupancy, and also aimed at intruders within the territory. Both members of the pair display while they walk about. There is no vocalisation. Territory intrusions mostly occur during the spring, but there is also a peak in October-November. I can only presume that this pair of crows are a pair ot territory owning breeders. They do look in great shape! 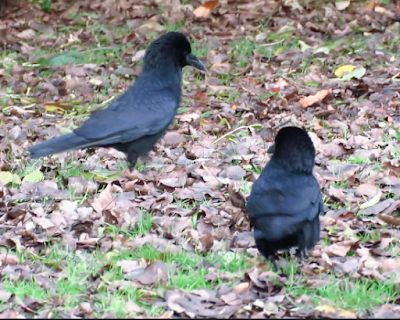 This is a still from a video, which shows both members of the pair with their 'bristle heads'. 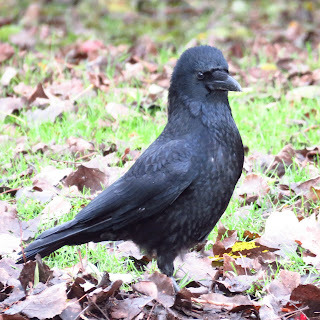 A side view of the displaying crow. 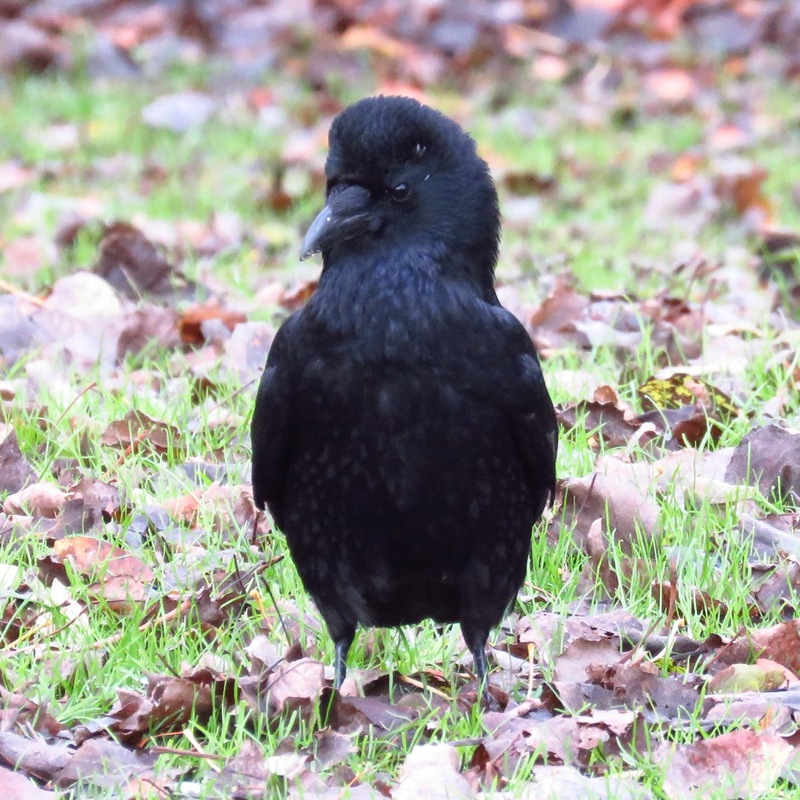 This photo is a bit overexposed, but it shows the details and metallic iridescence of the crow really well.